The movement of people between places is far from being a new or isolated phenomenon and is happening more often than before. This is also the case for individuals who moved from Brazil and Paraguay. Based on the existing literature as well as on data gathered in the landless camp Antônio Irmão, also known locally as the ‘Brasiguaios landless camp’ in Itaquiraí in the state of Mato Grosso do Sul, Brazil, this article explains how their search for a piece of land in either Brazil and Paraguay influenced the formation of the Brasiguaios identities. First, I briefly approach the foundation of transnationalism scholarship, which guided my research. Next, I demonstrate how land policies in Brazil and Paraguay, aimed at developing their respective border regions, played a role in the migration of Brazilians to Paraguayan and then the return of a number of them to Brazil. Last, I share the narrative of individuals in the Brasiguaio landless camp in the pursuit of land in either country. At the core of my argument is that the Brasiguaio identities of this landless group result from their pursuit of land rather than from migration processes. 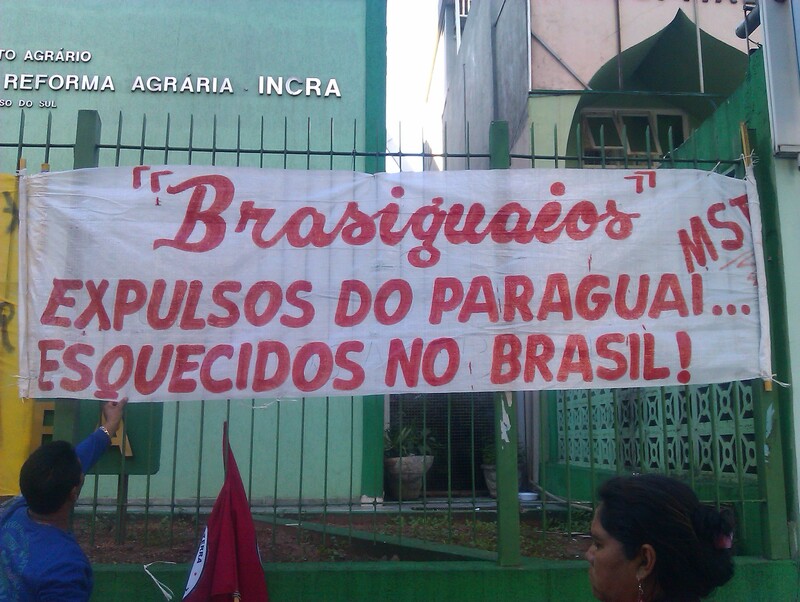 Albuquerque, J. L. (2010), A Dinâmica das Fronteiras: Os brasiguaios na Fronteira entre o Brasil e o Paraguai. 1st ed. São Paulo: Annablume. Massey, D. (2005), For Space. Oak, CA: Sage. Palau, T. and Heikel, M. V. (1987), Los Campesinos: El Estado u las Empresas em la Frontera Agrícola. Asunción: BASE/PISPAL. Palhares, I. (2011), O modo como se pensa a divisão da terra. ComCiência, http://comciencia.scielo.br/scielo.php?script=sci_arttext&pid=S1519-76542011000900006&lng=es&nrm=iso, accessed 22 July 2017. Resende, G. (2011), Novo Horizonte do Sul Revive sua Origem da Reforma Agrária. Novo Horizonte do Sul -MS Available at: http://www.geraldoresende.com.br/imprensa/noticias/novo-horizonte-do-sul-revive-sua-origem-da-reforma-agraria, accessed 20 June 2017. Tiburcio, J. (2011), 'Brazilians in Paraguay: A Growing Internal Problem or a Regional Issue?’ in: Kemp, W., Popovski, V. and Thakur, R. (eds.) Blood and Borders: The Responsibility to Protect and the Problem of the Kin-State. Tokyo -New York- Paris: United Nations Press.